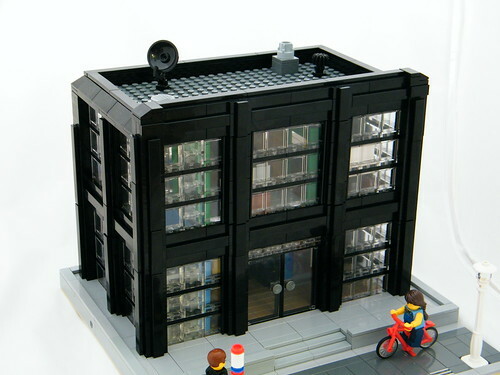 Brick Town Talk: Gaming Goodness - LEGO Town, Architecture, Building Tips, Inspiration Ideas, and more! D-Pad Drive - (BTT) The gaming industry is certainly at a bit of a crossroads lately. Physical copies or digital distribution? $60 epics or 99¢ time wasters? Analog sticks and buttons or motion controls and touch screens? Whether this is exciting or frightening is a matter of opinion, but the fine folks at Brickin' Games have done their finger exercises and are ready to code the next great blockbuster. Working in their Mies van der Rohe-esque modernist headquarters - the dark steel exterior contrasting brilliantly with the bright and cheery interior - this company truly has an office as slick as their products. Thanks so much for the blog! Love the description too!